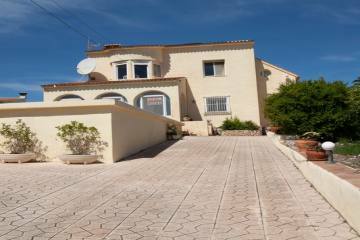 One leveled refurbished in 2017 Villa for sale in Javea on the lower slopes of the Montgo in Valls area, walking area to Restaurants and a local clinic. Located on a flat corner plot with a car and pedestrian entrance to the property via a large driveway. This sunny Villa consists of 3 double bedrooms with a large main bedroom with en suite bathroom and further two bedrooms sharing walk-in shower, living area with a fireplace, glazed terrace and a bright modern kitchen. The outside area has plenty of parking space and a carport. A lovely private pool with Roman steps and large sun terrace to enjoy the sun. The property also includes Central heating. This property is ready for you to move in and enjoy !